This year’s Asian Games will be held in Incheon, South Korea. This is the third time that the country is going to host the largest sporting event in Asia. The first time was in Seoul in 1986 and the second was in Busan in 2002. 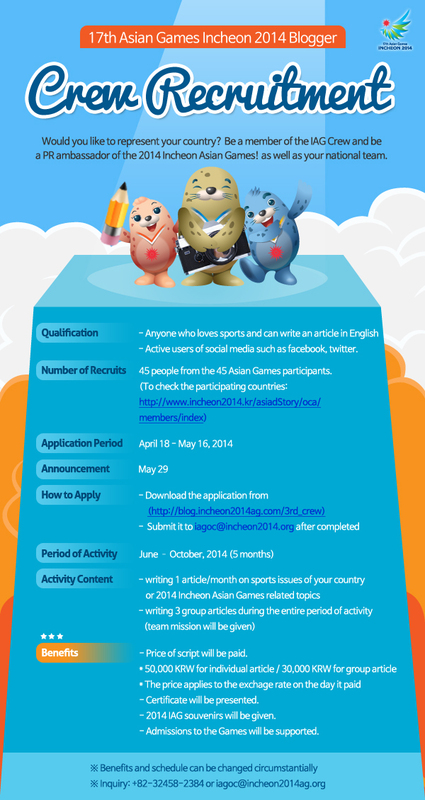 Korea is currently looking for writers around the world who are passionate about sports and can compose articles in English about the 17th Asian Games which is set to take place in Incheon Asiad Main Stadium from September 19 to October 4. One representative will be chosen from each of the 45 countries that will join the games. The selected writers will be given admissions to the games and paid cash for their articles. They will also be presented with souvenirs and certificates. What are you waiting for bloggers and writers out there? For more information, read the poster below or click this link.